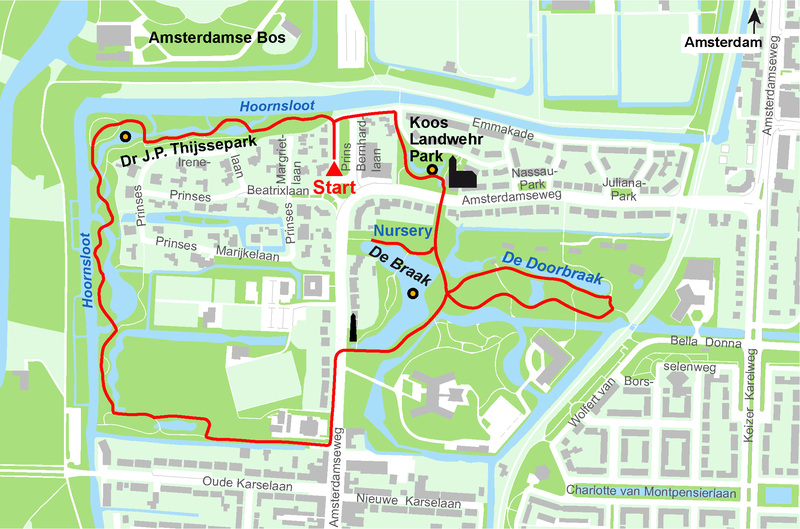 Where are the Amstelveen Heem Parks located? The botanical parks are located within the city of Amstelveen. Amstelveen is situated south of Amsterdam. The entrances to the parks are reconizable by an information sign. The parks are open to the public all days of the year. Bicycles and dogs are, not allowed in the park. Native plant Nursery Garden De Braak can be visited on workdays between 8:00 and 16:00 hrs. The parks can be reached by service busses 357, 358, 347 and 186 from Amsterdam Central Station and the Amstelveen bus station, which stop on Graaf Florislaan. From there it is a 11-minute walk to the entrance of the Dr. Jac. P. Thijssepark on Prins Bernhardlaan next to no 8. Location: depart from the entrance to the Dr. Jac. P. Thijssepark, on the corner of Prins Bernhardlaan and Emmakade in Amstelveen, Netherlands. 1500 meters from Amsterdam border.